Family and friends of missing journalist Ahmed Rilwan Abdulla gathered today (August 25) at the People’s Majlis after presenting a letter requesting MPs’ help in finding the Minivan News journalist. “Please don’t do this. Help us. Please. I don’t know where he is. I do not know if he is alive. I do not know if he is dead,” she begged the police. Sobbing, she told authorities that she raised her five daughters and four sons alone, with Rilwan being the youngest in the family. Rilwan was last seen on the Malé-Hulhumlé ferry in the early hours of August 8, less than an hour before neighbours reported seeing a man forced into a vehicle outside his home. Police have released a statement on Sunday, saying that they have widened the search for the missing journalist to include guesthouses, vessels, and nearby islands. “No matter how poor we were, I raised my children with love. He is a good boy. I am not trying to protest here. Let me stay here. I have waited at home all of these days patiently. But today, I came here to plead with you to find him. 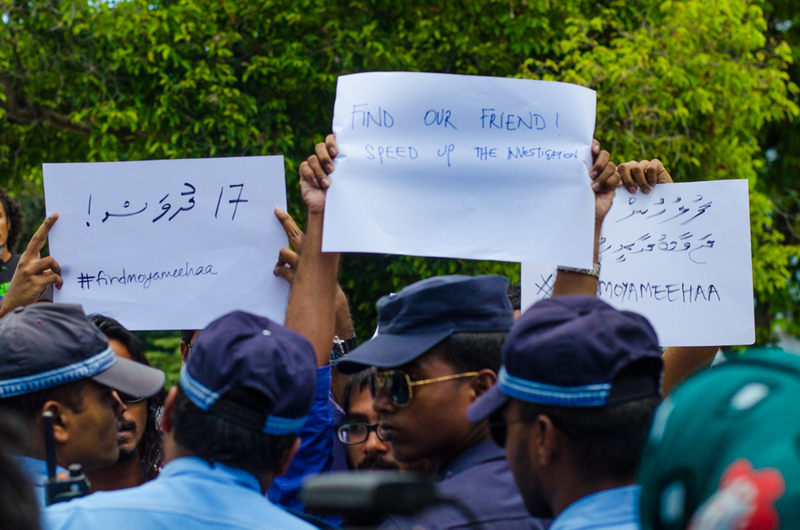 The demonstrators, who gathered at the People’s Majlis around 10:30am this morning, held signs urging the authorities to speed up investigations. ‘Today Rilwan disappeared. Who will disappear next?’ read one of the signs. ‘Majlis, do your job, ensure security for all citizens,’ read another. The peaceful demonstration was quickly moved away from the Majlis buildings, behind a set of police barricades. 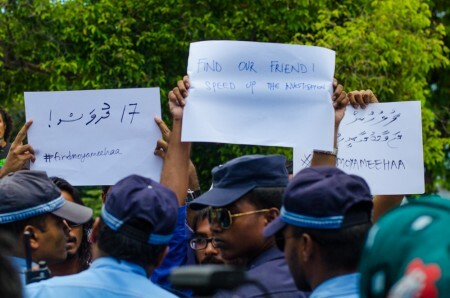 “Today was a clear example of how stupid policies inadvertently compound the psychological distress and trauma experienced by victims of crime,” said Rilwan’s friend, Maryam Adam. “We were not aggressive or contravening logical laws. The family needs to know they can trust the authorities and that their pleas are being heard. Being able to wait outside Majlis was important to us symbolically,” she added. Rilwan’s brother, Moosa Rilwan, who attended the demonstration said the group had gathered only to show concern over the progress of investigations. “We, the family, are very concerned. We do not believe [the state] has done enough to find him. We are deeply saddened there has not been adequate efforts through the Majlis,” Moosa told local media. Another member of the demonstration, Yameen Rasheed, highlighted a lack of urgency from the Majlis regarding this case. In the letter submitted to Majlis Speaker Abdulla Maseeh Ahmed, family members highlighted that Rilwan, in addition to being a journalist, is also a human rights advocate on social media and a long time blogger. “Rilwan has received numerous death threats from anonymous sources in connection to his writing and thoughts,” read the letter. The letter also stressed that Maldives police services have failed to give adequate information at a time of increased insecurity, with young people assaulted, killed, and anonymous murder threats sent to young writers and journalists. It also noted the resolution submitted to Majlis and the ‘241′ security services committee, a five member select team determined earlier this year. “I beseech you, as Speaker of the Majlis, prioritise this important case, and for the sake of all Maldivians, question commissioner of police to find out the truth. I plead with you, find out how my son is. Please take all necessary steps through the Majlis,” read the letter. The thoughts and feelings of Rilwan’s family and friends have also been captured on film as part of a coordinated media campaign designed to raise awareness of his abduction. The Maldives media community recently released a joint statement on the creation of a new a committee to pressure the state to expedite investigations into Rilwan’s disappearance and end intimidation of the press. In addition, International groups, including the Office for the United Nations Commissioner for Human Rights (OCHR) and Reporters Without Borders have called for a speedy and thorough investigation. Moreover, the New York based Committee to Protect Journalists urged the authorities “to leave no stone unturned” in their efforts to find him. Meanwhile, Rilwan’s family have offered a reward of MVR50,000 (US$3,240) for information leading to his successful return. Speaking at the ‘Workshop on Migration Processes and Policies in the Maldives’ held yesterday (August 21) in Malé, Minister of Foreign Affairs Dunya Maumoon emphasised the importance of addressing the gaps in the law and issues in its implementation. The minister reiterated the commitment of President Abdulla Yameen, to address the issues and challenges with regard to migration management in the Maldives. She thanked the International Organisation for Migration (IOM) Development Fund for its assistance in protecting the rights of migrant workers and welcomed the recommendations detailed in the initial findings report, “A Review of Migration Management Processes and Policies in the Maldives”. Ahmed Amjad of the Friendship Association of India and Maldives told Minivan News that the seminars hosted by IOM in January had been very effective. Speaking at the event, Dunya stressed the importance of striking the right balance between excessive permeability of the borders, with excessively regulated migrant labour markets and having safeguards to prevent exploitation of the system by both employers and migrant workers. Furthermore, Dunya emphasised the importance of distinguishing illegal migrants and undocumented workers, and orienting policies accordingly. Highlighting the fact that the majority of migrant workers in the Maldives are from Bangladesh, Dunya stated that the study tour to Bangladesh, conducted in May this year for Maldivian Government officials, contributed immensely towards the work of the government with regards to migration management. Earlier this year the Department of Immigration and Emigration deported 6,400 migrant workers between January and July and was holding 159 workers in detention as of July 22. According to the department, barring a handful arrested on criminal offenses, all were undocumented – some having worked illegally for up to 12 years. The current special operation to deport undocumented workers was announced on April 24, with Minister of Defence and National Security Mohamed Nazim – also in charge of the immigration department – promising “the whole [of] Malé will be cleaned [of migrant workers]” within three weeks. The 2014 US State Department’s Trafficking In Persons Report highlighted lack of procedures to identify victims among vulnerable populations, and inadequate training for officials. Climate change could cause annual economic losses of over 12% of the Maldives’ GDP by the end of this century, says a new Asian Development Bank (ADB) climate and economics report released today (August 19). “A potential ocean rise of up to 1 meter by 2100 will have devastating consequences for this island archipelago, where the highest natural point is only a little over 2 meters above sea level,” said Bindu Lohani, ADB Vice-President for Knowledge Management and Sustainable Development. The Maldives is the most at-risk country in South Asia from climate change impacts, said the report titled ‘Assessing the Costs of Climate Change and Adaptation in South Asia’. Given the uncertainties of climate change, there is a slight possibility that the losses could swell to more than 38%. But if mitigation and adaptation steps are taken, the Maldives will benefit the most in the region, with annual losses limited to around 3.5% of GDP by 2100, the report concluded. Programmes and Advocacy Manager at local environmental NGO Ecocare Maeed Mohamed Zahir, however, believes the government is currently far from taking such steps. “There is no clear-cut adaptation strategy,” he added. According to the report, the Maldives’ energy supplies are particularly at risk from climate change. The Maldives’ energy vulnerabilities are related to the low elevation and small size of islands, the report explains. Their low elevation and narrow width makes powerhouses and associated infrastructure vulnerable to flooding and damage from severe weather events. The report also notes that, with the commitment to become carbon neutral by 2020, the country is increasingly investing in renewable energy technologies, particularly solar power, for which there is abundant solar energy — 400 million MW per annum. However, President Abdulla Yameen has also pledged to explore for crude oil in the Maldives as an alternative means of diversifying the economy and supplementing fuel supply. In addition, the report highlighted that vector-borne diseases could be a major public health concern for the Maldives in the future. Dengue is now endemic in the country with seasonal outbreaks, observed the report. Epidemiological data shows changes in the seasonal nature of dengue, spreading across the atolls, and leading finally to epidemic proportions. Morbidity from dengue by 2090 could increase to 34,539, with 324 deaths per year, the report stated. Moreover, although malaria is not prevalent in the Maldives, it could be future concern if left unchecked said the ADB. During 1990–2003, the number of malaria cases averaged 16 per year, with no fatalities. However, the report warns that annual morbidity due to malaria incidence by 2090 could reach more than 200. Ecocare’s Zahir argued that the government is at best unclear, and at worst unprepared, for climate change. Speaking with Minivan News, Zahir appealed to the government to reveal their policy for adaptation in the face of climate change. He went on to explain that in the last four to five years there has been no clear stance on climate change from the government. “The number one priority is to make everyone aware if they have one,” he said. Back in 2009, former president of the Maldives, Mohamed Nasheed, unveiled a plan to make the Maldives carbon-neutral within a decade. Zahir suggested that the following administration’s have been less clear on the issue. Ecocare has previously accused the Maldives as being “not prepared at all” for the projected acceleration of sea level rise caused by the collapse of a glacier system in Western Antarctica. Officials from the Ministry of Environment and Energy were not responding to Minivan News at the time of publishing. The Presidents Office has announced China’s decision to lend 100 million Yuan (around MVR250 million or US$16 million) as free aid to the Maldives. The agreement was signed yesterday (August 16), after President Abdullah Yameen departed on an official visit to China to attend the opening ceremony of the 2014 Summer Youth Olympics, and to hold discussions with Chinese President, Xi Jinping. In addition, an agreement was made to provide the Maldives Police Service with 150 motorcycles. According to the statement, the grant aid is to be used for developmental projects in the Maldives. At separate meetings held on Saturday afternoon, discussions were focused on the investment opportunities in Maldives, and the mega development projects proposed by the government. Furthermore, Yameen met officials from Tuniu, one of China’s top travel agencies, and attended a lunch hosted by the group. During the discussion on Saturday, Xi also conveyed his government’s ‎commitment to propel bilateral relations with the Maldives onto a higher ‎plane. In addition, Yameen outlined the key ‎developmental projects envisaged for commencement in the time ahead, and ‎emphasised that no project is as important or pertinent as the Male-Hulhulé bridge. Xi thanked Yameen for briefing him on his ‎economic agenda and assured that he would alert Chinese authorities to ‎collaborate closely with the Maldives in ensuring the key development ‎projects, including the bridge can be implemented with due urgency. In return, Xi noted that the Maldives would feature among ‎the countries that are included within the Silk Road sphere. Referring to the Chinese ‘New Silk Road’ project, Yameen told reporters prior to the trip that the government was “very interested” in participating in the initiative. Yameen also revealed that a number of bilateral agreements would be signed during the visit, including a framework agreement on trade assistance, while Chinese assistance in providing police vehicles would be “formalised”. Chinese news agency Xinhua reported yesterday that China’s maritime ‘Silk Route’ would pass through the Ihavandhippolhu Integrated Development Project – or ‘iHavan’ – in the northernmost atoll in the Maldives. “The design of the project seeks to capitalise on the location of the atoll, which lies on the seven-degree channel through which the main East-West shipping routes connecting Southeast Asia and China to the Middle East and Europe,” reported Xinhua. The slow loris illegally trafficked into the Maldives has been spared euthanasia after Monkey World – a center for abused and neglected primates – offered to re-home the animal at their sanctuary in Dorset, England. “This has never been done before, to move endangered species overseas from the Maldives. This has been an amazing, unprecedented international effort,” Dr Alison Cronin, Director of Monkey World told the press in Malé today (August 13). The small primate, which is an Appendix I listed species of CITES – giving it the highest level of protection in international trade of wildlife – was discovered during a police raid in the capital in January. Shazra Shihab from the Ministry of Environment and Energy explained that the government had been trying to rehome the animal ever since, but had struggled due to issues relating to costs, transportation, and the loris’s unknown country of origin. “However, with tireless dedication from one party, and cooperation from all relevant government organisations of both countries, as well as dedication from other involved parties on both sides, we have now found a home for the slow loris,” she added. “I first heard that the Bengal Loris had been confiscated in the Maldives by colleagues who work in Asia rescuing wildlife,” Dr Cronin told Minivan News. The animal will now be taken back to the UK and paired with another of its species, she explained. “We believe this to be a male Loris, and we have a home for it in England with a female Loris, so he will have a wife,” Dr Cronin added. The illegal Loris pet trade boomed after video clips which depict the animals as a cute and docile pets went viral. However, the video craze has obscured the trauma and suffering that the animals endure at the hands of illegal traffickers. Far from its cuddly depiction, the Loris secretes toxins on its wrists which – when combined with their saliva – deliver a toxic and very harmful bite, Dr Cronin explained. “It’s a very bloody, painful and horrible process, leaving the animal crippled,” revealed Dr Cronin. According to Dr Cronin, the Bengal slow loris in the Maldives has not been checked over yet, as she prefers to minimise the stress for the animal during the transportation process. Dr Cronin also revealed plans to check the slow loris’ DNA once back in the UK, to find out the animal’s country of origin, which may then present the possibility to a return to the wild. “Everybody in the Maldives can feel pleased and proud of both the law enforcement and the government ministry for bothering to stick with this for so long,“ Dr Cronin concluded. Professional free-surfer Dave ‘Rasta’ Rastovich, defeated seasoned campaigner Taylor Knox in the grand final of the Four Seasons Maldives Surfing Champions Trophy yesterday (August 10) to be crowned the 2014 champion. The event saw six former world champions, including Knox, Rastovich, Sunny Garcia, Taylor Jensen, Fabio Gouveia, and Rochelle Ballard battling it out all week at Sultans Point. 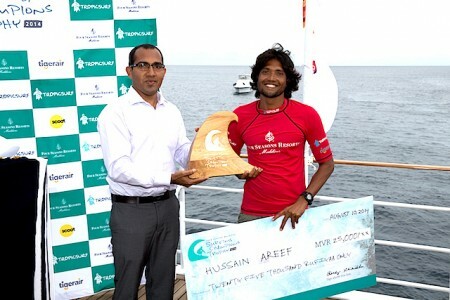 For the third consecutive year, Hussein ‘Iboo’ Areef won the hotly contested Domestic Champions Trophy which showcased the island nation’s depth of surf talent. The ‘goofy footer’ (right foot forward stance) defeated Ismail ‘Kuda Issay’ Miglal, Amid ‘Ammaday’ Agil and Mohamed ‘Billu’ Irushad. “The Maldivian Surfing Association is forging ahead in leaps and bounds. 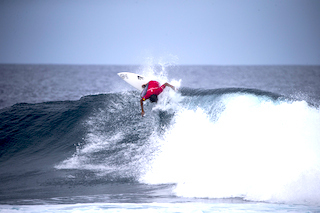 It’s fantastic to watch surfing progress at both a performance and organisational level in the Maldives,” he added. This is the fourth year that Four Seasons and Tropicsurf have held the event, and the third year that Maldivian talent has competed in the domestic category. After national champion Areef last year highlighted the need for more local involvement in the competition, many of this year’s competitors agreed that there has been a vast improvement in the involvement of local surf community. Spearheaded by collaboration with the Maldives Surf Association (MSA), the 2014 competition saw more local involvement, including Maldivian shadowing judges. There remains one change Afeef would like to see in next years competition, however. “It would be great to get a chance to surf against the champions, even just one local guy to compete in the main event,” stated Areef. Similarly, Dave Rastovich commended the local surfing talent and stressed the need for local participation. “Its crucial to involve the local community, especially in surfing. There have been big divides,” Rastovich told Minivan News. Rasta went on to highlight the important link between privatisation and the divide between local and international surfers. “It suits a few, but to the detriment of the many,” Rastovich warned. Rastovich, a dedicated marine conservation activist, went on to highlight some of the environmental issues faced in local oceans – a topic which has often intertwined with Maldivian surfing culture. “So the great thing about here is that you’re not there yet. There’s still species, there’s still populations here, you have the time. It’s a no-brainer both ecologically and economically to preserve and protect,” encouraged Rastovich . Speaking at the grand final ceremony yesterday, Minister of Tourism Ahmed Adeeb explained the government’s new enthusiasm for the development of surfing in the Maldives. “It was the youth who identified, who kept pushing us, to develop the surf,” explained Adeeb. The surf breaks of the Maldives have been a battle-ground in recent years, with local surfers, ministries and resorts engaged in heated debate since 2011 over access to the waves. After years of pressure from local campaigning against privatisation, the Maldives government appears to have retracted its original stance, announcing that all popular surf and dive spots have been freed from any access restrictions. “We believe there are a lot of surf points in the Maldives that need to be protected, and we need to make it a sanctuary for the surfers,” stated Adeeb. Ahmed Aznil, president of the MSA, pointed out that free breaks are not all plain sailing. The key to success, argues Aznil, is keeping the breaks well managed and to maintain clear communication between the government and stakeholders. Meanwhile, the next Maldives’ surf competition will be the Red Bull Both Ways event, held at Sultans breaks between August 20 – 30. The competition, which has fifty slots for Maldivian surfers, challenges Maldivian and Sri Lankan surfers to ride both left and right waves. The Maldives Government will not hesitate to implement the death penalty, the Ministry of Home Affairs has assured. The statement follows a wave of attacks within the past 7 days, including fatal stabbings in Malé and Thulusdhoo. The Home Ministry said that the government “will not hesitate to implement the death penalty placed by the courts upon persons who stab and murder with the willful intent to kill,” according to local media Sun Online. The ministry also said that the Maldives Police Service is conducting a number of special operations to prevent further attacks, assuring that the government is taking every possible measure to bring an end to the outbreak of violence in the capital. Measures to re-introduce the death penalty were finalised in April, while local media reported last month that the Maldives Correctional Services (MCS) had completed a facility in which to administer the lethal injection. Minivan News has been unable to obtain comment from either the Home Ministry or the MCS regarding these preparations. Prior to this policy change, the Maldives had maintained an unofficial moratorium on the death penalty since 1953, when Hakim Didi was executed by firing squad for the crime of practising black magic. Several people have been sentenced to death during the moratorium, although they have traditionally had their sentences commuted to life imprisonment by presidential decree. Despite widespread concerns over the state of the Maldivian justice system, Minister of Home Affairs Umar Naseer said the chances of killing an innocent person after completing all the procedures in the regulation was “far-fetched” and “almost impossible”. Conversely, Amnesty International have pointed out that the decision to resume the death sentence is in contradiction with the International Covenant on Civil and Political Rights – a treaty to which the Maldives became a party in 2006. Similarly, The Maldivian Democracy Network (MDN) has condemned the Maldivian government’s decision to implement the death penalty. “Given the state of the Maldivian judiciary, which is also perceived to be highly politicised and corrupt, it is most concerning that as grave a matter as life and death of humans is to be decided by it,” the MDN stated. “In addition to this, research shows that capital punishment does not deter murder any greater than the threat and application of lesser punishments,” the statement concluded. The practice of the death penalty, and the use of lethal injections, has recently grabbed international headlines again after aconvicted murderer in Arizona appeared to take two hours to die. Joseph Wood’s death is the third such instance in the US this year, and has prompted a suspension of executions while the state undertakes a review of its procedures.